The adoption by the Plenary Session of the European Parliament (EP) of a resolution recommending the suspension of accession negotiations with Turkey by a large majority in a vote on 13 March 2019 is a strong political message against an ever-deeper authoritarianism and the recent regime change towards a presidential system of government in Turkey. The resolution adopted by the EP clearly highlights the AKP’s one-man system that disregards the achievements of the modern world as well as the destructive consequences of this system for our country. Although the ruling party underestimates and qualifies as worthless this resolution on the grounds that it is not binding, it is of utmost importance for Turkey. Moreover, the worth and value of this resolution are to be determined by the institutions of the European Union rather than the ruling AKP. Indeed, this resolution will provide the basis for the relations between the new EP that will be take office after the direct elections, which will be organized from 23 to 26th of May, and Turkey during the next 5 years. There is a great risk that it will become harder for Turkey to make progress on issues such as visa liberalisation and upgrading the Customs Union Agreement during this new period. As the primary culprit behind these negative circumstances that Turkey has been dragged into, the ruling AKP has gravely undermined Turkey’s European future as it has done with all of the achievements of the Republic. Narrow-sighted European leaders and leading EU politicians who have vetoed even the opening of chapters on fundamental rights and freedoms as well as the independence of the judiciary and provided the single-man regime in Turkey with pretexts with their attitudes and actions contradicting European principles are the other players that have contributed to this outcome. 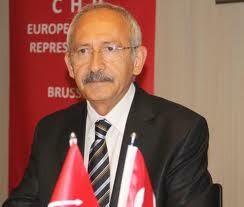 The AKP government has failed to internalize the importance of the fundamental values shaping the main framework of EU-Turkey relations such as the Copenhagen criteria, democracy and the rule of law, continued to reduce its relations with the EU to the situation of refugees and blackmailed EU member states over refugees, used reforms on fundamental rights and freedoms, which are the common denominators for EU member states, as bargaining chips and displayed a behaviour that embarrassed Turkey. This behaviour is also a sign of the ruling party’s unwillingness when it comes to Turkey’s membership to the EU. However, recent polls have shown that an ever-growing number, 78.9%, of citizens of the Republic of Turkey, who are fighting against an authoritarian government, support the objective of EU membership. On the other hand, a call to the European Union to suspend negotiations with such an important country as the Republic of Turkey, whose foundation relies on its orientation towards Europe, as was made today by the European Parliament, is attempting to reduce relations with Turkey to the level of a third world country. This attitude, to put it in the simplest terms, is not a European attitude. Europe is a strong idea; it relies on transformation and progress. Those who do not feel this self-confidence and the European responsibility to structure the Europe of the future will condemn the EU to being an introverted actor that fails to globalise. As CHP, we consider Turkey’s full membership to the EU to be a fundamental objective in line with the founding values of the Republic and a milestone that will allow our citizens to become equal individuals in the modern world. We embrace our bid for full membership to the EU. We would like to reiterate CHP’s commitment to Turkey’s full accession to the EU as a sine qua non of Turkey’s resolve for modernisation. As Turkey goes through this exceptionally dark period, millions of citizens remain resolute in their fight for democracy and freedom. We have no doubt whatsoever that Turkey will regain its strength with its democracy and economy. We will continue to work so that a mindset that prevents the politicization of the judiciary, removes the oppressive guardianship of the executive on the other powers and re-establishes the rule of law reigns once again in Turkey, to embrace EU criteria and to fight to preserve fundamental rights and freedoms. History will remember the kind of role Europe ends up playing in this process. This role will also serve as the litmus test for the European identity and the European ideal. As expressed by groups from all segments of Turkey that value democracy, law and justice to European leaders and politicians at every opportunity, we hope that Europe plays a contemporary and progressive role at this critical juncture. In regimes that are not libertarian, the only way for the struggle is through more freedom and democracy. We hope that the resolution of the European Parliament will be evaluated by the Council of the European Union in line with this historic responsibility.